Upside-down people, spider-crawls, twisted limbs. Body-horror is one of the mainstays of the genre. However, for the 1 individual in 100,000 born with the rare disorder genu recurvatum, walking on all fours could be a matter of everyday life. 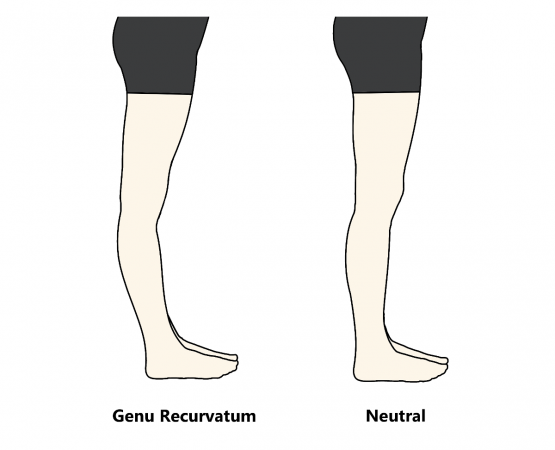 Genu recurvatum, which loosely translates to "backward bending-knee", and also known as congenital dislocation of the knee (CDK, an acronym I'll use here on out), is a condition wherein the subject's knee joints are capable of hyper-extension. There are other facets to the disorder, including the permanent dislocation of the patella, as well as subluxation (dislocation and rearrangement) of the tibia (shinbone) on the femur (thighbone). There's also a slew of comorbidities which present with the condition. In mild cases, the knee is capable of a greater range of motion, and might need extra support. In severe cases, the knee may bend backwards entirely, creating a bird or insect-like appearance. Individuals with severe CDK are often seen moving about on all fours as that is the easier way to get around. So what causes this?! Sadly, we're not sure exactly what causes CDK, but there are several factors that doctors believe contribute to the condition. It is broadly associated with breech births, and occurs in women more than men. It is also said to occur in people where ligamentous laxity (loose ligaments) runs in the family. There have also been a few cases of multi-generational families featuring the condition being passed down, but this is not the norm. Usually CDK is isolated. These days CDK is diagnosed early, and there are a variety of treatment options including serial casting, skeletal traction, and surgery. For a disease that is rare in the first place, it is even more exceptional that a CDK case is allowed to develop without treatment to the severity which we see in individuals such as Ella Harper. In the Victorian era, CDK was virtually unknown to medicine, with only a handful of cases being reported prior to 1880. Diagnosis of the disorder increased after 1900, but by then Ella Harper had quit her career in showbiz, and hopefully settled down to a lovely family life. Sadly, little is known about Ella Harper, but here are all the facts I could find (graciously curated by J. Tithonus Pernaud of The Human Marvels). Ella Harper was born approximately around 1870, in Hendersonville, Tennessee. 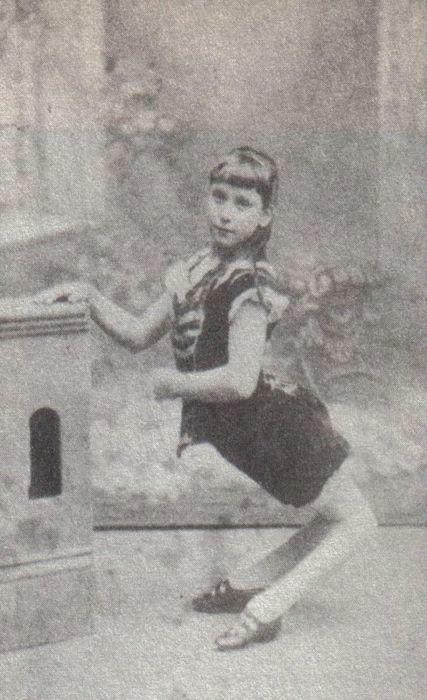 By the age of 16, in 1886, Ella was the star of W. H. Harris's Nickel Plate Circus (a name so amazingly Victorian I can barely handle it). She toured with the circus making fat stacks of $200 a week and getting featured in the papers of each town she visited. 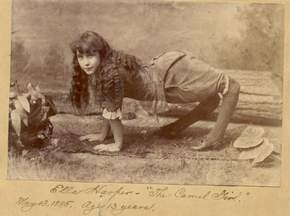 When Ella performed, she would often be accompanied by an actual camel, because circuses aren't particularly subtle. "I am called the camel girl because my knees turn backward. I can walk best on my hands and feet as you see me in the picture. I have traveled considerably in the show business for the past four years and now, this is 1886 and I intend to quit the show business and go to school and fit myself for another occupation." You go, Ella Harper! Hell yeah. It seems like she made good on her word too, because after 1886, nothing more is heard of Ella Harper. There is some evidence that she got married. The name Ella Harper appears on a marriage certificate with a Robert L. Savely in Sumner County, Tennessee, in 1905. The name appears again on a death certificate dated 1921. However, we're not certain that this is the same Ella Harper of Camel Girl fame. But I hope it is. I hope she had a nice life. In conclusion, so often horror movies use reversed joints to scare us. I think the horror is based on how "wrong" most people consider backward-bending knees on an instinctive level. However, I daresay this might be born out of a lack of exposure. Useless anecdote time! One day I was hanging out at a wedding reception, and we were talking about the wildest ideas that would change everyday life. One guy said "What if all our knees bent backwards?! Chairs and all our furniture would be completely different!" I didn't know how to point out that backward bending knees weren't actually science fiction, that they actually happened already, but then I'm also clever enough to know that congenital birth defects and side-shows don't make for polite wedding reception banter. Also, I didn't want to miss the couple with my fist-full of birdseed. So I just let him ramble on about what pants would look like, and made a joke about Ikea, I think. What I mean to say is that Ella Harper, like almost anyone from a "freak show", sounds like a really cool girl! I would have loved to have had tea with her. And as such, after all this research, I'm honestly wondering whether backwards joints will freak me out the next time I see them.